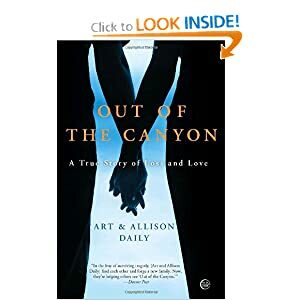 Ghost Town Ventures of Los Angeles has purchased the movie rights to “Out of the Canyon ,” an inspiring story of how two people managed to survive the tragic deaths of those closest to them and how they found the courage and strength to move on to build a new family together. Ghost Town Ventures, founded by brothers Alex and Max Schenker, plans to turn Allison and Art Daily’s book into a feature film. Originally from San Antonio, the team will consist of Alex Schenker as writer/producer; Max Schenker, producer; Alexandra Ryan, writer; Louisa Oberman, producer. Allison and Art will oversee authenticity of the production. In 1995, Art lost his wife and two young sons when a boulder dislodged from Glenwood Canyon and struck their car. Allison lost her brother to suicide. Art must decide whether to live on – and then what that life should be. Art doesn't know hope – until he meets Allison. This is the story of their journey, which begins in hard places but becomes incredibly healing and filled with joy. "Never before had I read something that gave me so much faith in our ability to come back from such a devastating tragedy. The second I closed the book, I put in an offer on it,” said producer Alex Schenker. “We partnered with Louisa Oberman who first brought the book to our attention, and started to build our team by bringing in one of the best up and coming writers I know, Alexandra Ryan. Together we are going to create something beautiful, a film that will break your heart and build it back up, new. That's what the book did for us. That's what we will try to do for you." Ghost Town Ventures is currently producing a movie in Utah called The Devil’s Punchbowl. Adam Wingard is now attached to The Devil's Punchbowl, which is slated for production later this year. Written by the Schenker Brothers, The Devil's Punchbowl follows Dylan Massey and his expecting wife, Savanna, who after inheriting a pristine Montana ranch must fight to survive a century old blood feud raging on their land that has become known as the Devil's Punchbowl. In addition to the Schenker brothers, the team includes Eric Watson (Pi, Requiem for a Dream), Houston Hill, and Jeremy Platt (Rob Zombie's The Lords of Salem) will be producing. This is a heart wrenching story that that truly touches the soul. The story that you read here takes you on a journey that will show you the depths of emotions, sadness and grief which gripped the Daily family. At the same time, the book takes you to the depths of their experience, but then brings you back from the brink and allows you to see and experience the healing and growth that can occur after a tragedy occurs. You are also able to see how these powerful experiences draw the authors closer and solidify their love. This book is an amazing read and one that you will be amazed by. I cannot say enough positive things about this book and I know that all that read this will be changed for the better.